The recent release of Organizations was the most significant change we’ve made to Retrium since we started. Not only did it make it easier for customers to manage access to Retrium and gain more visibility into usage, but it also made it so that we can release features even faster. Win-win! We’re addressing the top requested customer features with the goal of making meetings in Retrium the most customizable and collaborative retrospective experience possible. We're also working to ensure that we use industry best practices in our app, so you can be certain your Retrium-powered retrospectives are in alignment with the processes suggested by Agile experts. With all this in mind, we released custom column-based retrospective techniques a few weeks ago, and now we’re releasing more features that address the most pressing needs of all our customers. In many retrospectives, ideas, feedback, and notes are grouped together into themes and then given a title to express the collective thought behind the group of sticky notes. Whether a retrospective is live or distributed, the energy of the room can sometimes drop during this process, lowering engagement and making this part of the retrospective seem unnecessarily long. We’ve heard reports from many of our customers that they would like the “grouping” process in Retrium to be more efficient and collaborative, and our release a few weeks ago addresses this feedback. 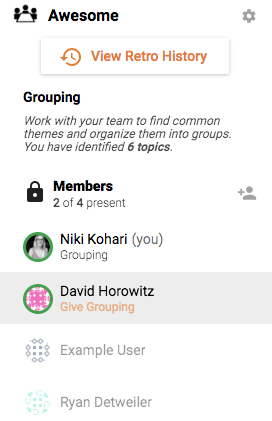 It allows teams to share the grouping responsibilities with anyone who is present in the Team Room. Before this change, only the facilitator of the retrospective could move the notes into themes and add titles, restricting who could actively participate in this part of the retrospective. Now passing responsibilities to someone else is simple. The facilitator of the retrospective starts out with grouping responsibilities, but they can easily give it to someone else using the easy-to-understand controls in the side navigation panel. The new person can then group as many items as they need to by using their mouse to drag similar notes into stacks, just as the facilitator could do before. Anyone responsible for grouping has the option to pass the role on, so everyone can get a chance to participate. Additionally, the facilitator can take back the grouping responsibilities when necessary, and the team can proceed to voting when everyone is ready. Now that grouping notes into themes is available to anyone on the team and the responsibility can be passed around from person-to-person, this opens up the question of who to pass it to and when. Knowing who is present in your retrospective can help you determine this, so we've released this feature also. 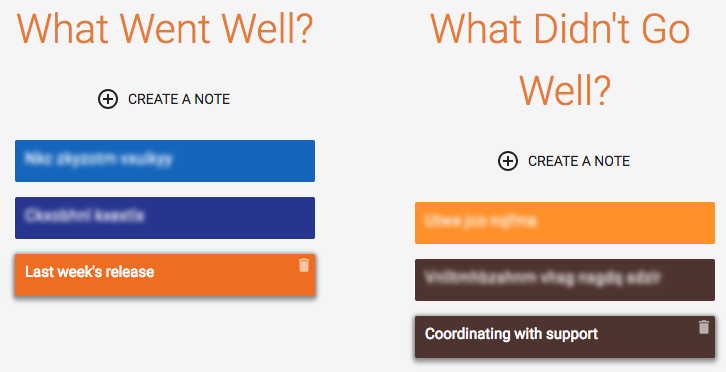 You may have noticed the addition of a side navigation panel recently, and when you were in the Team Room, this left sidebar showed a list of everyone who has access to the Team Room. Now that side panel includes more than just who has access; it also shows who is currently present in the Team Room. Anyone who is currently participating in the retrospective will be shown in the top of the “Members” list. Additionally, they’ll have an indicator to show they’re active. This not only shows you who is a good candidate to group notes into themes, but it helps you understand who is participating in the retrospective without knowing exactly what that person is writing during the brainstorming step. 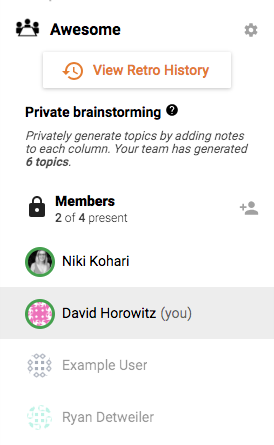 Now that there are more access controls for Team Rooms and active retrospective participants are clearly shown, there may be some concerns about maintaining the anonymity of the retrospective content. After all, anonymity can be important for psychological safety and trust, depending on the nature of the work environment or the sensitivity of the information discussed. Because we always want to strike the right balance of security, collaboration, and safety to ensure the best insights are shared during retrospectives, we’ve recently made anonymity enhancements to Retrium. Prior to this release, a single individual was always associated with a single color. This information was often used to help understand how many people were present in the retrospective, since this information wasn’t always available in our product. Even though colors were randomly assigned, once someone alluded to a note being one that they wrote, it was clear that all notes of that same color were also ones that they had written. This created "quasi-anonymity" instead of true anonymity, so we wanted to make changes based on the customer feedback we’ve received. Now, all note colors are randomly generated, so two notes of the same color do not necessarily belong to the same person. You can still easily distinguish your notes from others, so you can find the ideas you wrote with a quick glance because there's a shadow under your content. We explored many options here, but opted for maintaining note colors (as opposed to making all notes the same color) to keep grouping fast and efficient. Teams often identify a note based on its position and color, so we wanted to ensure that was still possible after the anonymity enhancements. We’ve adjusted the way that votes are configured and made some updates to the user experience based on customer feedback. 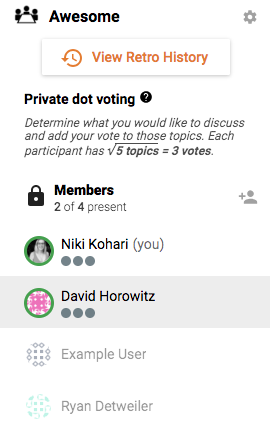 However, Retrospective participants are still able to vote privately during the voting step of the retrospective and use their votes on whatever topics they believe are most important to discuss as a team. Previously, all retrospective participants were given five votes during the private voting step of the retrospective. This number was given by default, regardless of the number of participants or ideas shared. Now, votes are dynamically set based on a formula considered to be the best practice in Agile for determining the correct number of votes in a retrospective. This formula is that the number of votes for each person is equal to the square root the total number of groups and ideas in that particular retrospective. (For example, the square root of 16 possible topics for discussion = 4 votes per person). Because we now have a side panel with retrospective participant information, the number of votes remaining is shown there. 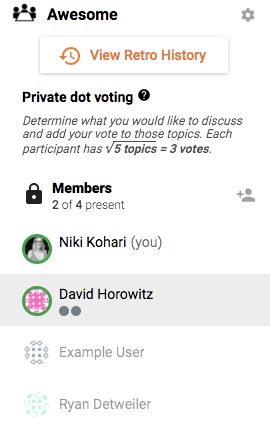 Votes are shown as “dots” under the name of the participant, and it’s easy to add your votes using the “plus” icon near the note or group of notes. To go along with the anonymity changes, votes are now the same color for all users, so their information is not easily identified during the discussion step of the retrospective. We know we’ve covered a lot of changes here, so please reach out to support@retrium.com if you have any questions or feedback on these features.